We love Trey Ratcliff’s HDR photography. His photos of places all around the world makes us want to go there on our next vacation. 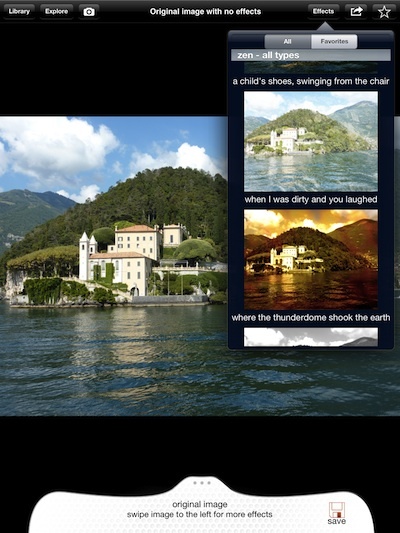 Everything that Trey Ratcliff is involved in is High Dynamic Range, he has an app for the iPad that brings out a whole new look to your photos. The app is called 100 Cameras in 1 HD (separate version for iPad and iPhone), and it actually brings a lot more fine tuning than just 100. Instagram has gotten photo filters into the main stream of people’s thinking when they want to quickly enhance a photo on their iPad. The 100 Cameras in 1 app offers a completely different line of thinking in the filter area. 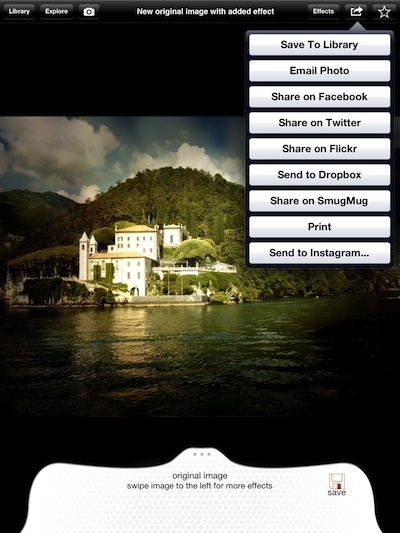 Photos are imported from your iPad photo library or taken with the camera on your iPad2/New iPad. If your iPad is loaded with apps, you are given the option on import to use a full resolution of a smaller file size to avoid crashes. Image enhancements are for the full image, not a smaller square. Two ways to see the filter options applied is done by swiping across the photo side to side or through a ‘Effects’ button pull down. After you have the filter effect applied (don’t worry, you can change it to another no matter what editing stage your at), drag the lower drawer up to gain access to the included fine tuning tools. Rotate, vignette, contrast, and brightness are common tools. 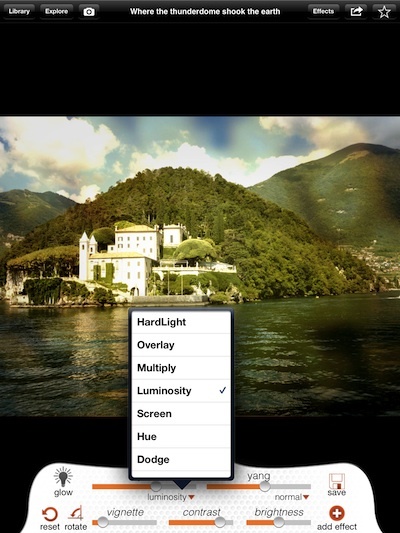 Hidden behind a menu lets the sliders adjust HardLight, Overlay, Multiply, Luminosity, Screen, Hue and Dodge. Then, the ones that you may not find outside of 100 Cameras in 1; ‘Glow’, Ying and Yang. Earlier we mentioned Instagram, that is just one of the many share options when your done with your photos tuning in 100 Cameras in 1 HD.